Every year is the same, one hell of a ride. We experience all sorts of ups and downs but what does change is how we approach each passing moment. There wouldn't be a good year without the bad, am I right? 2016 is no different, I've made stupid mistakes. Closed and opened some opportunities, even missed some. Sometimes I can't help but be stuck in that moment, unable to move on and pull myself back up. I would go over it again and again without much progress. Thus, wasting my precious time. It's easier said than done to get back up after you get knocked down. You'll need the time and energy to get back up. In order to get your momentum back, you will need to start moving. It's liking riding a bicycle. You will need to get one foot down on the ground - keep yourself grounded and be realistic. Remember to get your hand on the handlebar - control what you can. And then you push with your foot to start moving. Now, if you're only learning how to ride a bicycle, there's no certainty you're going to ride your way down the beautiful sunset rainbow blah blah blah without much trouble balancing. You will inevitably waver and might even fall off or crash. It might take awhile for you to learn and you will make mistakes along the way. 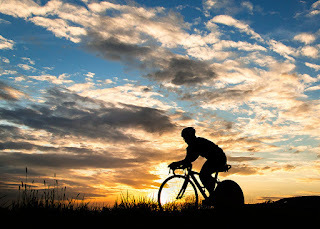 However, once you get a hang of it, you will not have any problem cycling wherever your bicycle may lead you to, maybe(Like have you seen those crazy cycling routes? Sorry kinda digressed haha). You'll learn from your mistakes and hopefully you won't make them again. You could say life's moments is pretty much like learning how to cycle over and over again. Going to end this post with a quote from Neil Gaiman.